The defending champion F2 Logistics Cargo Movers seek to advance to the finals as they try to finish off Foton Tornadoes in Game 2. The Cargo Movers had a 1-0 series lead in best-of-3 series after they outclassed Tornadoes in Game 1, 25-22, 25-23, 22-25, 25-22. Here is the details for Game 2 of F2 Logistics vs. Foton in the best-of-three Semifinals of the 2018 PSL Grand Prix. 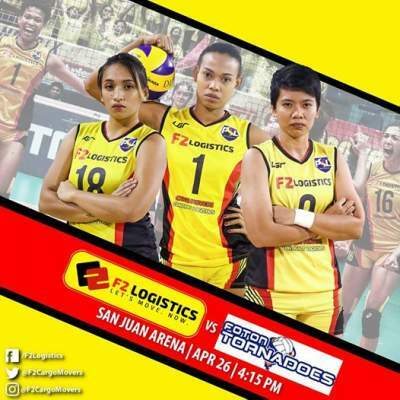 F2 Logistics Cargo Movers defeated Foton Tornadoes, 3-0, in Game 2 on Thursday, April 26.